Mango and Zara study. Which mobile marketing strategy generates more engagement? Seeing the great interest generated by the above comparison of mobile applications - Burger King vs. McDonald's - now we are back with a new article of the same style, but changing to the fashion industry: Mango vs. App Zara App. What mobile marketing strategy generates more engagement? Right now we are at the beginning of sales in Spain and the sales will increase exponentially, both online and in stores. Mango and Zara are two of the most powerful in the textile sector and with great international Spanish brands. Surely more than one consumer is using the app right now of her favorite brand for pricing or shopping. Let's start with the installation of applications on mobile! The application of Zara is available in a variety of Official Markets; you can install it on IOS, Android, Windows Phone and BlackBerry. Really, it's a good strategy, because although 94% of mobile devices sold today in Spain come with IOS or Android, it is important to consider small niche markets to reach potential customers than other competitors themselves discarded. Instead, Mango has made the commitment to focus their energies on Android and IOS. Actually, the most interesting strategy is that it has decided to create two applications: one called Mango and other Mango Man, only to men. This fashion house has innovated on the other hand, individualizing engagement through mobile devices depending on whether the target is male or female. We want to stress that the two brands have chosen to centralize mobile marketing strategy in one application. This is international and unique. There is a local app for each country where they have physical stores, but from the same platform can choose to jump start your country and language and automatically show you the offers and services that correspond to your region. Zara App: In total 646 people have voted, giving the application a score of 4.5 out of 5. There is a maximum score of 526 references and with the minimum of 51. Mango App: A total of 1,352 people provided a full valuation of 3.5 out of 5. With the highest value given by 565 and 371 users. Although the minimum grade is lower than that of Zara, the positive side is that it has raised twice the amount of comments than its competitor, which helps to understand that the application is widely used with IOS. Zara App: 40,001 consumers have rated this app so far, giving it a rating of 4.1 out of 5. In total, 23,041 have decided to give the top score and 3,440 people gave the minimum score. It has between 5 and 10 million downloads. Mango App: The average rating is 3.5 out of 5 taken from valuations of 9,081 users. 3,934 have given the maximum score and 1,710 gave the minimum. It has been downloaded by between 1 and 5 million users. Microsoft – Zara App: The rated 94 users in Spain, giving an average of 4.3 out of 5 stars. Blackberry – Zara App: The average is 3.5 out of 5 stars. Android – Mango Man:The app focused on men has a rating of 3.8 out of 5 and are rated 921 users, of whom 406 have five stars and 113 one. It's been installed between 50,000 and 100,000 people. IOS – Mango Man: Has 3 averaged over 5 107 have had their say consumers. In marketing the figures are an aid to understanding how is the current situation. Zara has a higher score on IOS but Mango has generated double reviews among consumers, with average high note. And Android Zara has more downloads the application to handle, but only notes average midpoint far from each other. 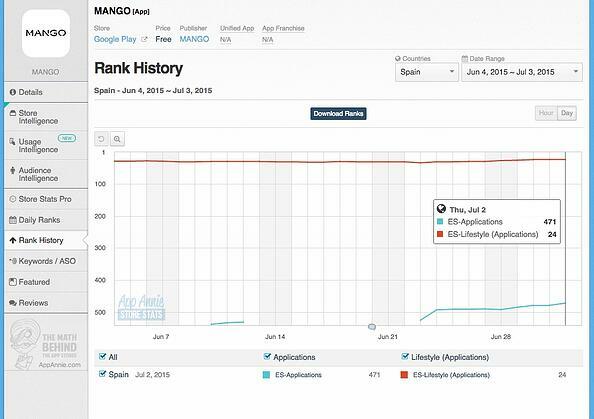 Mango Android App has the 471 position in the ranking of Spanish applications and within the category of Lyfestyle is ranked 24. 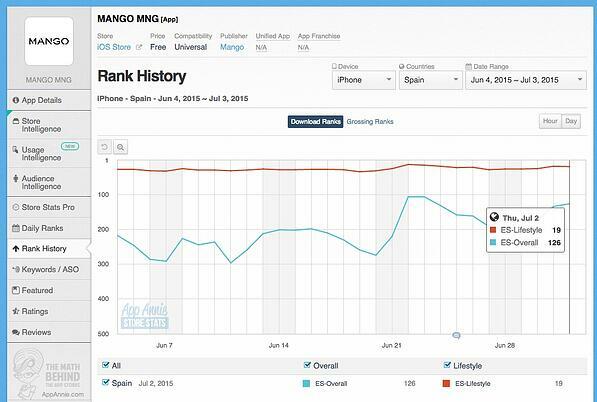 Mango App on the market of IOS has the 126 position in the Spanish general ranking and within the category of Lyfestyle is ranked 19th. 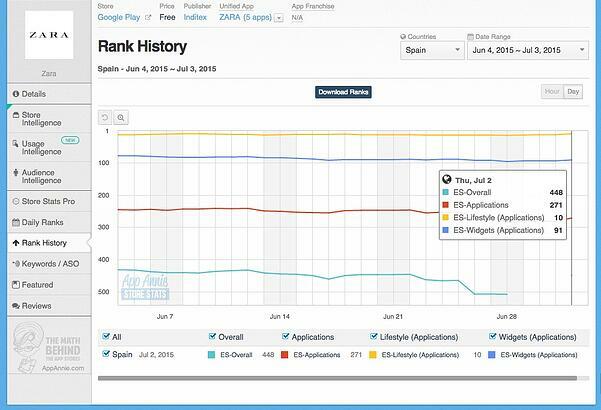 Zara Android App has the 271 position in the ranking of Spanish applications and within the category of Lyfestyle is ranked 10th. 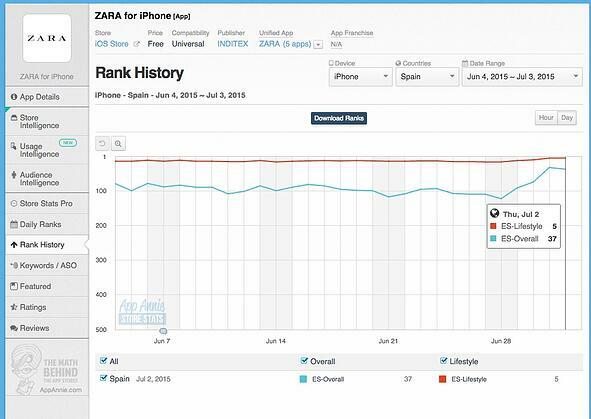 Zara App on the market of IOS has the 37th position in the general ranking Spanish and within the category of Lyfestyle is ranked 5th. Assist in the purchasing process. For example, to find the reference of a garment or a particular store. Although after the purchase is made from a PC or in person at the store. Generate mobile purchases. The application itself functions as e-commerce and can be ordered through them. Here it only remains installed and test applications as another user. My personal experience is on a smartphone Samsung Galaxy S5 with a screen of 5.1 inches, still a respectable size. 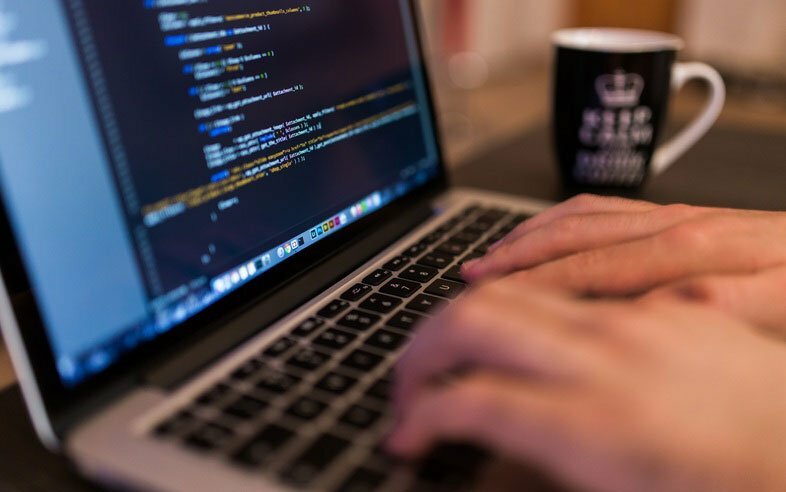 The application of Mango and Mango Man are equal to the web you can see from a computer. The design is simple, beautiful, minimalistic, plays with corporate colors black and white, with a higher prevalence of the first; thanks to which has a very bright finish. Images of models are staking a retro touch and color. You just get an image displayed and it offers you to choose the country, the region where you are and the language. It is focused on the sale and you can find the entire catalog-featuring brand for men, women and children. You can check social networks, magazine, ordering, purchasing, consult the address and what stores are in each place (without geographical location), it is a very careful implementation. The great pending task at Mango with your application is missing to adapt to the needs of demanding users with mobile: location of the nearest stores using GPS and simplify paragraphs. Because in reality the marketing department of this brand has caught the web and that is what it gives you almost directly through the App. This is a very visual and intuitive application. It has a white background design with colorful pictures of models that become the different sections of the program. With menus that take you directly to the collection you're looking for: it is a woman, man or child. Offers you know where the nearest shops of Zara by geographical location. All other services are provided by the two brands: Scanner for price of the garments in the store, register as a user to buy, basket and all products with their current prices. The two brands have maintained applications, with a sleek design and offer content in multiple languages and for multiple countries. The ultimate goal is to sell through mobile or assist in the purchase process (can scan the labels and know the prices of the garments). 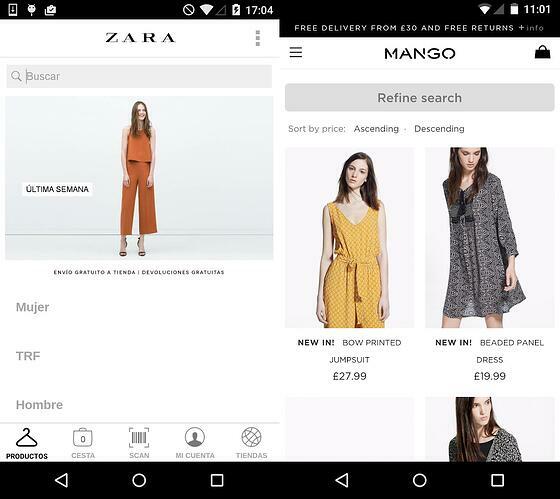 Mango application provides more informative content that Zara, since Zara is very focused on the final purchase, but Mango lacks better adaptability of the application to the needs of a mobile device. And thanks to the App Annie tool we can conclude that the application of Zara is better positioned in markets than Mango, thus enhancing better engagement with customers. Here you have my analysis and I hope to get your feedback. Explain to me what type of application you use or how you make purchases using your mobile phone!